I received my Hexagons Dynamic Textured Impressions Embossing Folder. What makes it Dynamic is that it's very thick and it makes a pattern that is very deep in the card stock. I spritzed my card stock before embossing so it really grabbed the paper. I love it! You need to make a different "sandwich" on your Big Shot, but it's very easy! My sentiment is from the Many Manly Occasions stamp set from the May 2016 Paper Pumpkin kit. I love my Paper Pumpkin kits! I get a new stamp set each month! You can join me in making something new and fun each month by going to my Paper Pumpkin link and choosing me as your demonstrator! 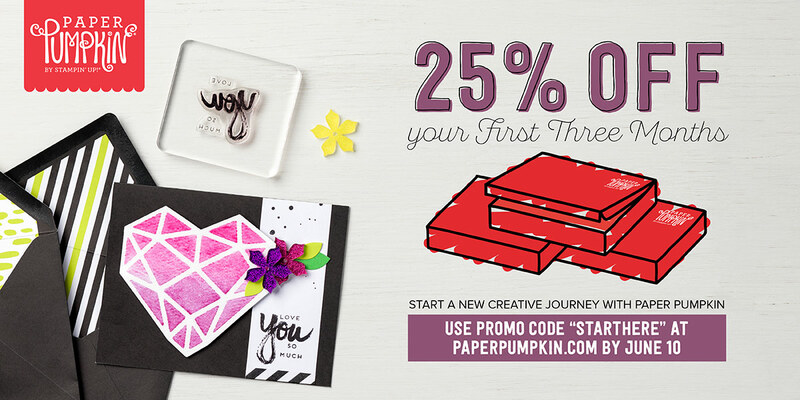 Right now you can sign up for three months (June, July, August) and get 25% off. You may cancel any time after the three months. Don't forget to list me as your demonstrator!